Feeling a lot of "should be's" today. Should be writing the letter of recommendation for a former student. Should be cleaning. Should be doing some schoolwork. But today has been busy. Two appointments today. Lot's of Art Therapy related stuff today. Just had a nice chat with a local Art Therapist who is going to come and speak to my class this semester. It is so great to network with someone...art therapists can often be very isolated in what they do. They are often the lone wolf in their settings. So it is so nice to sit and chat with others who get it! But now I'm feeling under the weather. Haven't been feeling great all day. Thought it was allergies but Claritin isn't really helping. Boo! I don't want to be sick. So I'm going to push off the "should be's" and lay on the couch! This layout just makes me laugh. I was going through pictures from last summer to take to my friends for scrapping night. I always laugh at Cary's fake serious face he made at the zoo. Then I happened to see it next to the picture of the eagle we saw that day. He loved the eagle. It was his favorite part of the zoo...is it because they look alike?! Hearing Kevin Youkilis speak saturday about the importance of people being aware of the issue of teen suicide...it isn't talked about enough. 10 more days til my guy is home! The connections I have been able to maintain with family and friends all over the world through places like Facebook. It has a lot of negatives sure...but it is nice to be able to see and hear how all these people who have impacted me in some way are doing. My Dad's handiness at fixing anything. The beautiful job Michael's did framing my large drawing. So. My computer is in the pc hospital with a virus. Started acting wierd the other day. Beware of a "program" called "Personal Antivirus." It is in fact a virus that is not preventable I've been told. It acts exactly like an antivirus software. It bypassed my McAfee. I am not amused. Why do these individuals who are so good at creating viruses not use thier powers for good?! Anyhow...in more positive news I won tickets yesterday at work to a fundraiser to raise awareness for teen suicide prevention and one of the Red Sox players will be there. It is in conjunction with his charity. I'm excited! It is a brunch/silent auction tomorrow and I'm taking my brother...I am hoping for some cool pictures. But...wait...won't be able to upload them til I get my computer back probably on Monday. Oh well :) For now it's Cary's computer. Which on the positive side forces me not to do any school prep work this weekend since all those files are on my computer! So there is a postive side to this?! Yesterday I got a suprise late afternoon call from Cary at his training. He will be home in 2 weeks! Then I went to my Yoga class. Bad idea. While I was talking to Cary I was sitting outside the studio and figured when I saw my teacher come in I would hang up. Well...there was a substitute. I should have stayed on the phone. I will call him - the substitute- "arrogant yoga jerk." And that is the nice name. He was so arrogant. He really hit me the wrong way. During the class he had to make sure we knew how knowledgable he was about Yoga and Pilates. Now many people in the class, myself included, are beginners. Many are not but still need some alterations to movements they are not ready for. He went full force and did the hardest moves without giving us any idea how to modulate them to our level. Many of the moves I know from my muscle conditioning classes you have to be careful of your back. Our regular teacher shows us the advanced move and the beginner move and encourages us to do what we can in that range. If your core isn't strong you have to ease into some of the moves gradually to strengthen without harming. He had no interest in that and actually a few times was chuckling at how much difficulty we had. I was not amused and sadly left feeling stressed. I usually love that class because it makes me feel centered and relaxed and strong. Not last night. But I will "let it go" which is another yoga idea I think...after every move you start fresh and "let go" of the previous one in your mind. Hopefully my regular teacher is back next week. I invited one of my friends over tonight to scrap. It has been so long since I have. I'm not sure if she can make it yet but I hope to do some anyhow. I have been focusing my attention on some of my other hobbies recently. I have found that I have SO many creative outlets there aren't enough hours in the day. I have been knitting lately and teaching myself crochet. Then I bought an embroidery kit to do some handtowels for my bathroom. I have also been itching to paint and do some mixed media stuff. But scrapping I haven't been doing. I guess lately I have been liking my projects I can do while sitting on the couch and watching TV at night. The problem is that I have trouble letting myself off the hook when I don't start/finish all the projects I want to. My Virgo/high achiever/perfectionist self! There are no rules in artwork. I need to remember that. There is no-one but myself pressuring me to work on all these projects. I realize I sound like I'm complaining in this post today. I need to refocus on positive! Keep my motto in mind: Let it Go! the sun being out and summer finally being here. a day to spend at the bookstore and Trader Joes with mom & lewie. a day off...long summer weekends. a night out in the city this past weekend to see Rent. my flowers and plants on the balcony. Ivory soap. It reminds me of having baths on Sunday night as a kid after playing outside all day. the possibility of a coffee from my favorite coffee shop! Gotta go get some coffee...haven't had any yet and a caffeine headache is waiting in the wings! ...but inside it is a beautiful representation of craftsmanship! Art everywhere! Here's the lobby's ceiling! Haven't taken any pictures recently...so I am posting a random old one. From about 2001. One of my favorite places to go. One of my fondest memories of living in DC was one day my dad had driven down to bring me home for a school break. 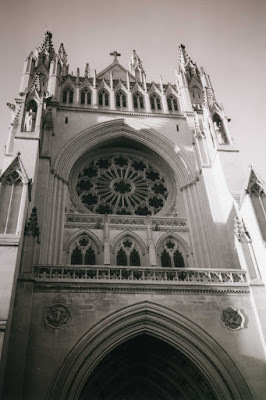 We stopped at the Cathedral on our way out of DC and they were playing the pipe organ. The most unbelievable sound...it shook. You felt it. Beautiful. 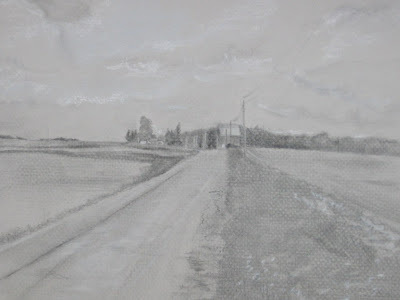 A charcoal & pastel drawing I did a few weeks ago from a photo I took in Cary's Maine hometown. to have one more day of vacation before it's "back to reality!" to have fresh flowers in my apartment today. it is only 25 more days before I see Cary's face. I have such a good relationship with my family. To have had laughs with my brother yesterday watching Season 1 of Malcom in the Middle. to be heading out for a morning at the beach with mom. to have a place to live. to have finally gotten one of my large drawings professionally framed so that it is preserved. Off to the beach with my mom today! Yesterday was a great day! Started off with a few hours at the beach. Only bummer was that there have been so few beach days I'm still getting roasted on any little spot I miss with sunblock! That's fair Irishness for you. In the afternoon I got a surprise phone call from Cary. He's doing good and it was so nice to have a longer phone call from him. Then last night I hosted Girl's Night last night. A monthly get-together with my high school girlfriends. It was so fun! I love doing stuff like that and hadn't been able to since my last hosting because of the apartment issues we had. I love cooking and home stuff and having people over and never do. BBQ pulled pork sandwhiches, baked "fried" chicken, potato salad, Greek pasta salad and homemade blueberry pie. It was great! This morning I sat by the pool for awhile and talked to a few friends and Cary's dad. I never talk on the phone that much but it was nice to feel connected. Tonight I plan on going to my knitting circle and getting some help with my shawl that has a mistake in it. Then my brother is coming over for dinner and DVD watching. Tomorrow is my last official day of vacation and it has been a nice relaxed one. I hope that I can hold onto some of this positive energy as I start off my work week. So often I get caught up in the stressfull nature of my work and I don't like what it has done to me. I want to hold on to what is important and get rid of the rest of the "baggage." Yesterday was a pajama day. But I did make it out to the gym. Spent the day teaching myself how to do Amigurumi. I have never crocheted...so it has been a learning experience! But being my perfectionist, overachieving Virgo self I was determined to get it right! I now have the head, body, ears, arms and legs for a bear. Doesn't look like much! He's a little wonky and crooked. He's not perfect but it's pretty cute so far. Before working on him I had been working on a shawl I've been making but was getting extremely frustrated with it...yarn overs in the wrong places...mistakes I need help fixing. I wanted to throw that off the balcony. So the fact that I have a bunch of misc bear parts is exciting! Tuesday I also finished up my first Christmas present...it will be for my sister (she doesn't read my blog)... the pattern is "Foliage" on Ravelry. My first finished lace project aside from a dishcloth. Ripped it back several times but finally got the hang of it. Also hoping to get some scrapping inspiration back. Haven't done any in awhile! Day 5 of my vacation and it's raining. But spent a day to myself and had fun so far anyway. Went out to breakfast at my favorite place and then walked around a neighboring town I don't usually get to...felt like I was away. Every store had gorgeous window boxes...even in the rain. Got a few small treats...a card to mail to Cary, a touristy sign for my kitchen and a soy lavender candle. Visiting not one but two yarn stores...left empty handed. On a budget this week and I really don't need to start another project. Plus I have knitting circle at my favorite yarn shop tonight. The sun has reappeared here in Massachusetts! We are on a roll...four sunny days in a row! I live so close to a beautiful beach. My mom enjoys the beach as much as I do. So many memories of going there as a kid. Cary was able to call me on the 4th of July. I'm on vacation...well staycation...this week. For Trader Joe's flowers at an affordable price. For good books to read. To all soldiers throughout the long history of this country. My tomato plant is growing well.